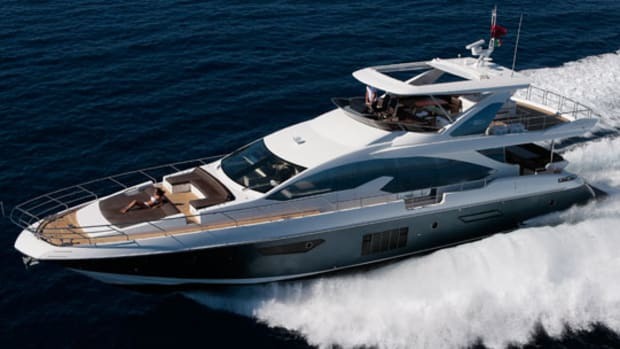 007 would love Sunseeker’s new, swoopy, performance-oriented Predator 80. And yes, that’s Bond… James Bond. 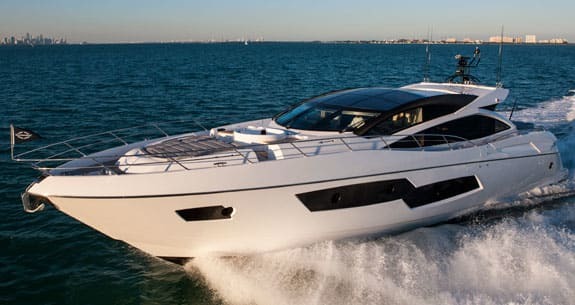 The moment I stepped aboard the new Sunseeker Predator 80, phrases kept popping into my mind and, no matter where I turned or how I tried to push them away, they kept recurring. There have been somewhere between 25 and 30 James Bond films, depending on whether you count the TV adaptations and some dreadful early low-budget efforts. But whether you prefer Sean Connery, Roger Moore, Pierce Brosnan, Daniel Craig, or any of the other 007s, one thing is clear: James Bond loves vehicles. From his slick Aston Martin to the underwater Lotus in The Spy Who Loved Me, from jets to a space shuttle, and a veritable array of boats, Bond used them all. 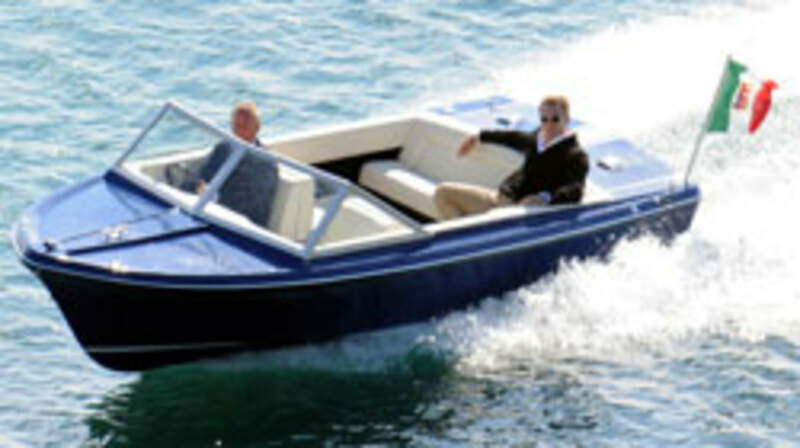 Early films used Glastron runabouts but, in recent films, the powerboats of choice have been seven Sunseekers. 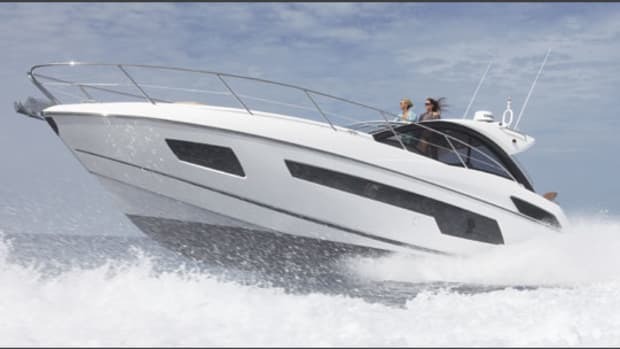 In The World Is Not Enough (1999), a Sunseeker Superhawk 34 raced down the Thames at 52 knots in the longest-ever pretitle sequence for a Bond movie. For Die Another Day (2002), it was a Sunseeker Superhawk 48 that saved Halle Berry after her cliff dive. 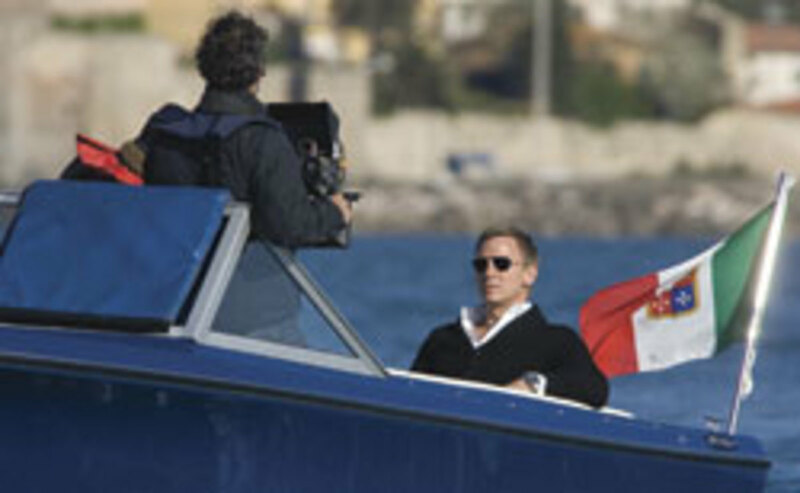 In Casino Royale (2006), a Sunseeker XS2000 races at 65 knots alongside a landing seaplane and later, it turns out the villain, Le Chiffre, is aboard a Sunseeker Predator 108. In Quantum of Solace, a restored 1970 Sunseeker Sovereign 17 takes Bond to a villa on the Tuscan coast (shown below) and the driver (in his film debut, top) is Sunseeker managing director Robert Braithwaite, CBE (Commander of the British Empire), who will sign autographs if asked. 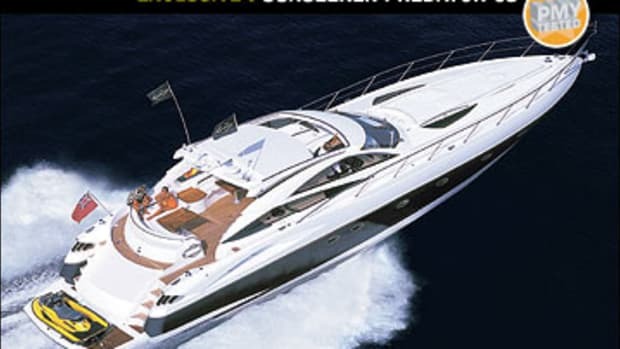 Also in Quantum of Solace, a Sunseeker Superhawk 43 is used as a tender for the 121-foot trideck Sunseeker 37 Meter yacht. It’s been a long and enjoyable run for Sunseeker and Bond… James Bond. Everywhere one looks aboard the aptly named Predator there’s a level of luxury so alien to most yachts that I fear my mouth dropped open at times. Not a good look for me, by the way. The other phrases? I’m not sure, but it may be against the law to speak Latin aboard a British-built yacht with Italian styling. But there it was. The highest achievement. The ultimate. And there was one final phrase I kept wanting to actually say out loud, perhaps with a faint smile and a sardonic wrinkling about the eyes. Sunseekers, of course, have been inextricably linked to 007, that most British of spy heroes, with seven Sunseekers appearing in recent Bond films. And that is no small tribute to this British company, since every boatbuilder in the world would give its firstborn just to have a boat appear in a scene with the nemesis of SPECTRE. Yet multiple producers have chosen Sunseekers because they knew that these yachts really do capture the James Bond spirit. Terminal decadence. Ne plus ultra. James Bond. Which isn’t to say that the Predator 80 doesn’t have a few quirks, just like the many actors who have worn the Bond persona. But what’s a tiny scar over the eye on a hunk like Daniel Craig or a few pecadillos here and there onboard a yacht of this magnitude? If anything, a few minor flaws simply add appeal to both man and yacht. The Predator 80 slots neatly into the Sunseeker Predator line between the 68 and 84 and, like other Predators, she is intended to be the most flexible type of yacht in the Sunseeker portfolio: equally comfortable whether running flat out or slowing down for a long-distance cruise. 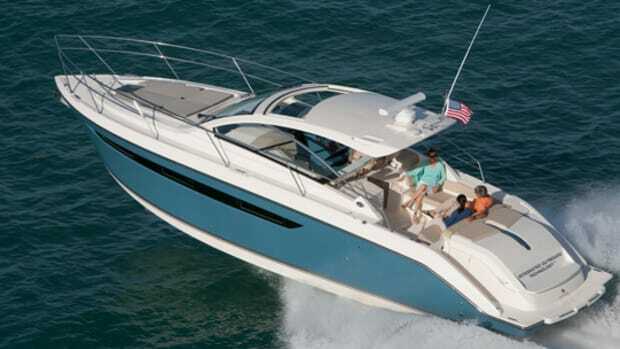 With an impressive list of options, owners can truly tailor the 80 to suit their own lifestyles. But, also like all Sunseekers, performance is an integral component of the design and it’s no surprise that Formula One drivers Jensen Button and Eddie Jordan officiated at the christening of hull number one. Amenities abound here. Just forward, there’s a large wraparound settee with a table that begs for alfresco dining. Tucked under the overhang is a wet bar on one side and an optional grill on the other to complete an outdoor galley. Carrying the alfresco theme into the saloon, three large sliders make the cockpit a seamless extension of the interior. Clever touch: EU regulations require that a boat’s design keeps water from entering the interior from the cockpit, a mandate that usually takes the form of a sizable step up from the cockpit to the interior. Sunseeker solved the issue in style by creating a “moat” between sliders and cockpit, and then covered it with a beautifully crafted teak grate. EU inspectors are satisfied, and no Predator 80 guest is going to stumble on an unsightly step because the sole remains flat from cockpit to helm. The Signature Look offers several seating arrangements in the saloon, and our yacht was fitted with inviting couches to starboard and, whoops, there’s that terminal decadence phrase popping up again! Instead of carpet around the coffee table, the sole is finished in leather tiles! No red wine for me, thanks, I’ll stick with the ’79 Bollinger—champagne doesn’t stain. Of note are the oversized windows surrounding the saloon, which not only allow seated guests killer views (a view to a kill? ), but also do the same for the skipper at the helm. In the forward port corner of the saloon is the dining area, with a settee around a wenge-and-leather table, plus four loose chairs to seat a total of eight easily. The décor is sumptuous, mixing figured anigre with wenge under a satin finish, though Amalfi hazelnut sounds more like a Ben & Jerry’s flavor than the warm color of leather chosen to blend with the impeccable joinery and stainless trim. As you move farther forward, you can’t help but notice the six large overhead windows that create a skylight effect and, in fact, there is a very large sunroof over the saloon that further creates an indoor-outdoor living area. The helm? The two Besenzoni pedestal seats are pinched straight from James Bond’s latest Aston Martin: electrically controlled, upholstered in gorgeous Navy blue leather, and immensely comfortable. The helm seat even has the autopilot and engine controls in the armrest. Should you need to reach the side deck, a door that is sophisticated enough for a space shuttle opens effortlessly. The dashboard is a blend of figured anigre with black honeycomb panels for an interestingly high-tech look. Two 19-inch Hatte-land displays handle the Simrad navigational presentations while a third hosts a sophisticated Sunseeker yacht-monitoring system. The Side-Power bow and stern thrusters as well as the Sleipner zero-speed stabilizers are hydraulic, and our test yacht was equipped with the optional ZF JMS joystick control system as well as dynamic positioning. Forward and down are the accommodations, with an atrium effect from the windshield above the foyer. Your first stop should be the master suite just aft, which spans the full 20-foot beam and, believe me, uses that space well. By offsetting the berth to port, the design team left enough floor space for a comfortable chair with hassock, plus a vanity/desk in a corner. The result is a stateroom that is large, and seems even larger. A walk-in closet (it’s much too lovely to call a hanging locker) is aft with a bureau, while the head features a granite sole and a large shower stall with rain nozzle. 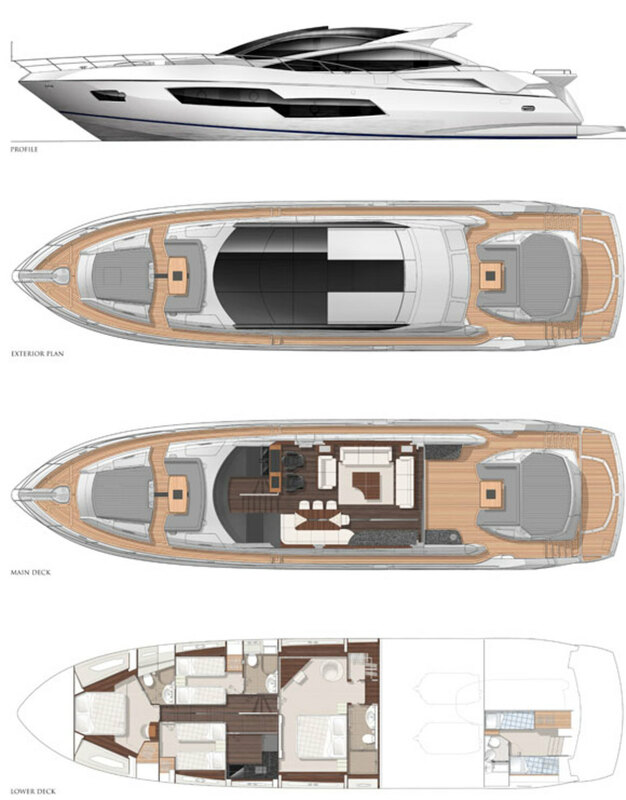 By locating the head and closet between the engine room and master, Sunseeker created a supplementary noise barrier in addition to its already impressive soundproofing. Underway, sound levels in the master suite wouldn’t disturb a baby. Up at the pointy end is the VIP cabin, an airy hideaway with desk and en suite head with shower. Like the master, this cabin benefits from generous floor space. In between these staterooms are two guest cabins with a couple of layouts that comprise the first of the aforementioned quirks. The port cabin has two singles that slide together to create a large double suitable for couples, while the starboard cabin has two singles that remain separate. Yet it is the latter cabin that has private access to the day head, thus creating an en suite cabin with two bunks that stay chastely apart. Couples staying in the double across the corridor have to tiptoe across to reach the head. Another oddity is that the cabin with two singles has more stowage, while the double cabin has barely enough for a bikini and a pair of sunglasses. But wait, could this arrangement be part of a clever plan? At the foot of the steps from the saloon on the port side is the galley, which, in true Euro-fashion, can be closed off so the chef can be hidden away like the crockery. Still, the chef does have a large window with an opening port, and the amenities are restaurant-grade, from the Sub-Zero fridge with two drawers to the Miele four-burner cooktop. A Miele convection oven and dishwasher finish the area, which surrounds the chef with the same satiny figured-anigre joinery as the guest areas. Speaking of crew, our yacht had the optional crew’s quarters aft, but, unlike many European yachts where this area often brings to mind the term “steerage class,” these digs are very civilized with two berths and a head with a full shower stall, which is sure to please. The crew cabin is offset to port to allow room for a large garage capable of swallowing a 15-foot Williams 445 jet tender whole, and which opens through an immense hatch onto the hydraulic swim platform for launching. One interesting modification on our test boat was on the foredeck, where the standard issue is a circular sitting area that would be lovely for a few cocktails at anchor. However, this had been replaced with a large Jacuzzi spa which, in my opinion, would prove an even better venue for those cold gin and tonics. 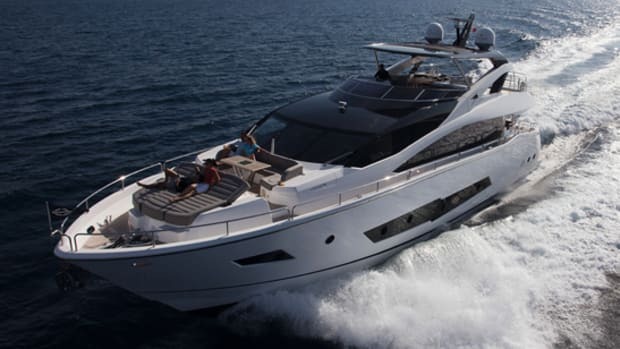 When it comes to power, Sunseeker offers enough choices to make even Grand Prix drivers salivate. Our test yacht had a pair of 1,800-horsepower MAN V12-1800s, which kicked us along at 33 knots without breathing hard. You can choose almost anything (short of outboards) up to a pair of 2,000-horsepower MAN V16s with Arneson drives that will quench your lust for speed at 46 knots, which, for the mathematically challenged, is 50 mph plus tax. Not too shabby for moving some 60 tons of wenge and Amalfi hazelnut through the water. There must be some sort of magic that takes place when the Predator 80 is underway because at rest she seems much larger than an 80-footer, especially in the master and VIP cabins. Yet when she is running fast and free, she’s as responsive as yachts half her size. I don’t want to confuse you with technical terms, but she’s a giggle to drive. Carving a great big S in the water is something you want to do the minute your fingers wrap around that small leather-covered wheel. It is, perhaps, the nautical equivalent of downshifting a sportscar in a tunnel: Who can resist? But the Predator 80 is way ahead of you, banking smoothly into turns and, because the props are in pockets, biting easily no matter the amount of helm input. Ah, yes, there are a couple of quirks when you’re hunkered down behind the wheel. If you’re standing, you can’t reach the sticks unless you happen to be double-jointed, because they’re somewhere behind you on the arm of the helm chair! And those wonderful overhead skylights also give you some dreadful reflections in monitors that you’d like to be monitoring. But again, who notices Daniel Craig’s scar? 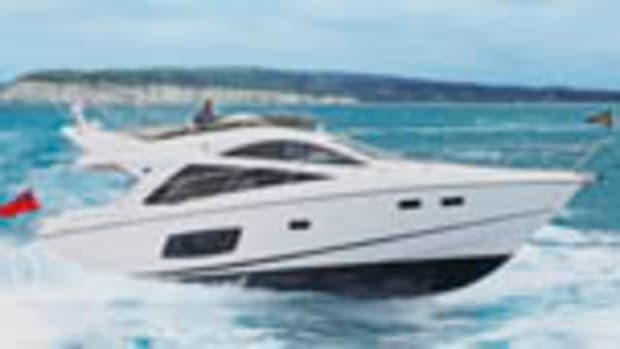 No, these little flaws just make the Sunseeker Predator 80 even more beguiling. Perfection is for the gods. 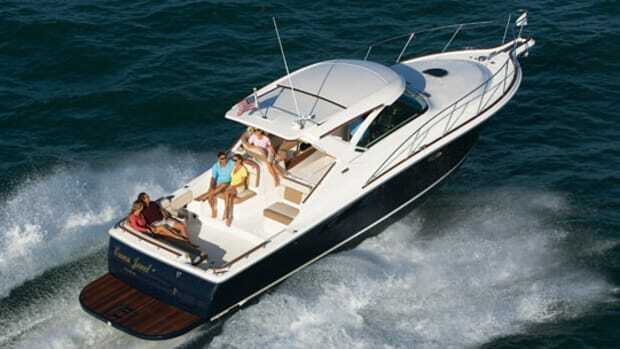 This is a boat to savor and enjoy and, okay, here’s the bottom line. The world may not be enough, but the Predator 80 most certainly is. NOTEWORTHY OPTIONS: Sleipner zero-speed stabilizers ($119,294); line voltage regulator ($18,725); Idromar watermaker ($20,184); tropical-spec A/C ($16,418); cockpit engine control station ($12,213); Simrad AIS radar, GPS, autopilot, and VHF ($10,551); JMS joystick control ($23,556). 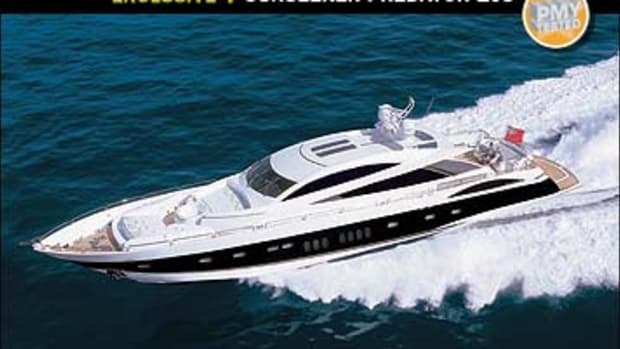 We wouldn’t mind paying homage to Britain’s coolest spy by cruising the Sunseeker 80 to some of 007’s favorite spots. Start off in Miami, a city skyline that has been feature in several Bond films, maybe with a martini at the Miami Blue Martini Lounge. Then run across the stream to Nassau, which appears in Quantum of Solace, Thunderball and Never Say Never Again, for some dinner at Gray Cliff. The next morning, head down to Staniel Cay and snorkel like Sean Connery in the Thurnderball Grotto. But hey, that’s just an idea. 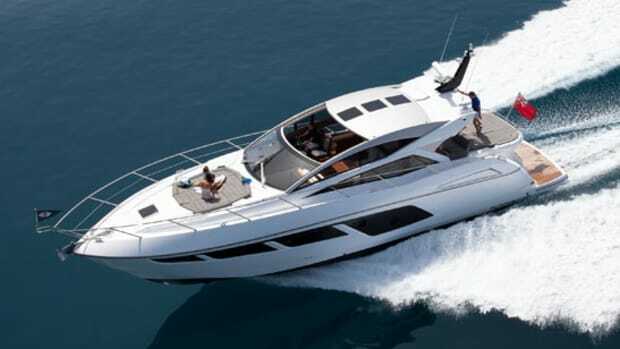 Where would you like to cruise the Sunseeker Predator 80? Like us on Facebook and let us know. 325 gal. fuel; 261 gal. water; 7 persons; 100 lb. gear. This article originally appeared in the June 2013 issue of Power & Motoryacht magazine.